One report for each [Main demographic]. A table that summarises all rating questions, showing a value trend for each over time. A compact summary of trends of all rating questions. Useful for an overview of trends and trend patterns. 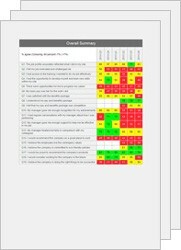 A compact overview of results that normally fits on a page. The frequency and range of data can be varied using the Timeframe button. Table cells can be heat-mapped and the values are coloured Red, Amber or Green ("RAG") to highlight low, medium and high values relative to a selected target or benchmark in Settings.